Homeopathic remedies will help a child with symptoms of rubella. Contact us to learn more! 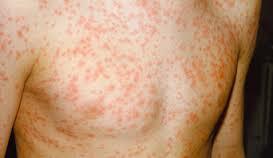 Rubella - German Measles is an infectious viral disease that occurs most often in the late winter and spring. Rubella can pass through a pregnant woman's bloodstream to infect her unborn child. The main medical danger of rubella is the infection of pregnant women because it can cause congenital rubella syndrome in developing babies. This remedy is for sudden onset of a rash with a fever. The children are usually very thirsty. Aconitum is only appropriate during the initial stages of this illness.